Jenny's ORIGINAL Hidey Huts! Still the best ~ a big piggy hit ~ with removeable, quick-wash potty pad. Jenny's popular Hidey Huts are back! Treat your piggies to one of the best hidey huts available today! 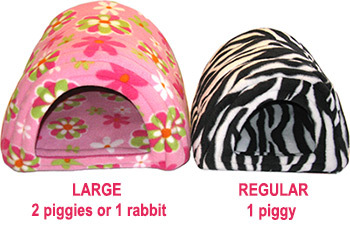 These huts are a wonderful addition to your cage and your cavy's comfort. They are sturdy, beautiful and functional. Extend the life of your Hidey Hut with our included removeable and washable matching potty pads! Just toss in the wash as needed. Our Hidey Huts' design is gorgeous and your guinea pigs will approve! They have been a requested favorite for years. My guinea pigs love it! I recently got this for my two guinea pigs and I am so glad I got it! This is their favorite cozy by far and the size is perfect for them! I highly recommend this for any type of small animal. Love this product so much! Our piggies love their hidey huts!! Our 2 piggies had never before known comfort like this! We purchased 2 hidey huts, along with a few other fleece features, and our pigs now spend most of their time either in or on top of their hidey huts. It's kind of hilarious, when they don't feel like being inside of the hut, they climb up on top of it, looking quite happy about their vantage point. Each hut is generously sized, plenty of room for even my larger guinea pig. Guinea Pig Market, thank you for these top-quality products! You are the best! My biggest regret is NOT GETTING THIS SOONER! I love this hidey! It is SO soft and stylish and my piggies adore it! I got the larger size which, beware, is HUGE and could probably fit 3 piggies. Also, the customer service here is AMAZING!!!!!! Highly highly recommend to anyone who loves their small animal! I have a lionhead rabbit, and she absolutely loves her hidey hut. It's perfect for her afternoon naps! Great quality, fast shipping. If you have a small rabbit that is not much of a chewer - get one! As far as my pigs are concerned, it would be animal cruelty to not own these. They're fantastic, hold up for years, and are worth every penny.